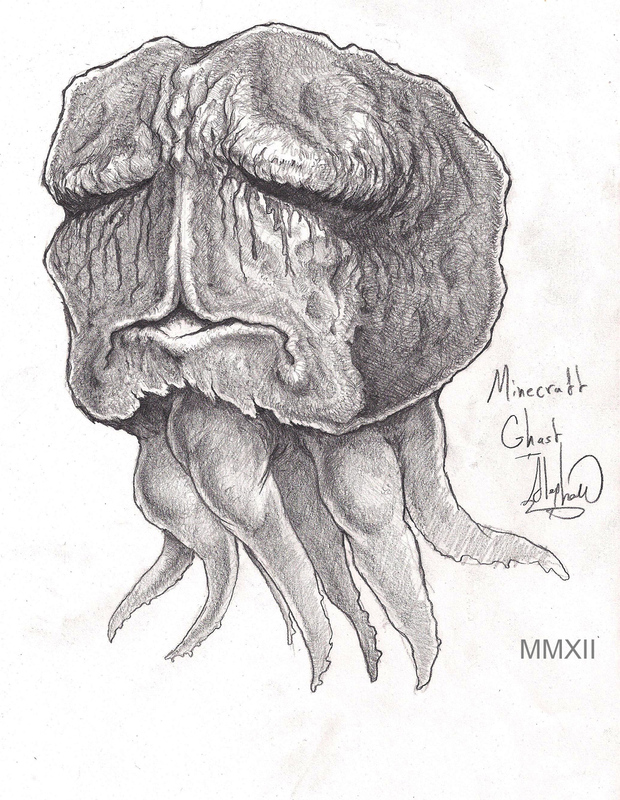 Another Minecraft monster piece. Since the creatures in Minecraft are so simplistic, they allow for a liberal amount of interpretation when rendering them in a realistic way. The Ghast is a bizarre entity, in both it's appearance and behavior. It appears to be constantly weeping, so it's eyes are cavernous and always flowing with tears. The mouth is a permanent frown, with a hair lip, that leads up it's face to an ever furrowed brow. Though only 7 tentacles are visible, they have 9. The Ghast seems to be trapped, both within itself and the Nether. It will not aggressively pursue you, but when in range it will attack. Check out my Enderman Fan Art and Creeper Fan Art too.